WWI Daily ($0.99): An app organized like a deck of cards you can flick through, with events from the Great War. It’s organized so you can see what battle or event was happening on this day or you can search for things by keyword. There are maps you can zoom into of battlefields and lots of information from Wikipedia included about the participants. Also available in the Android Market (s GOOG)($0.99). 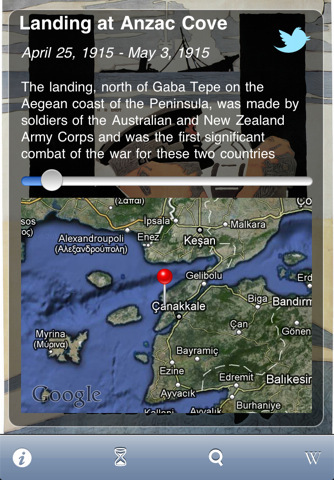 Civil War Today ($5.99) has been praised not only as a great history app, but one of the best apps for iOS (s AAPL), period. 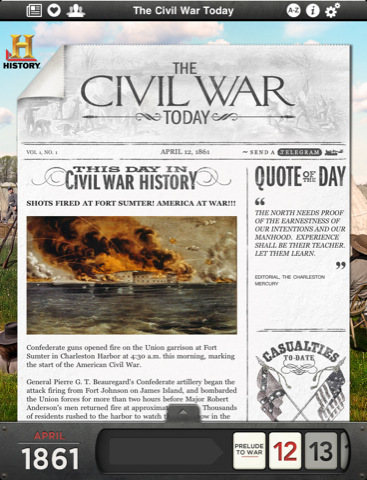 This iPad app immerses you in each day’s events during the Civil War, 150 years ago. Information is presented like a newspaper from that era, and has interactive features, taking advantage of the iPad’s multitouch inputs and rich graphics. Rama (free): A location-based walking tour app I’ve mentioned before, is great when you’d like to soak up information about a place you’re visiting. In the U.S. you can download curated tours of the Antietam Battlefield in Maryland ($1.99) or Revolutionary War sites in Philadelphia ($1.99). U.S. battlefield locators: There are a variety of apps that are less dependent on where you are, but are also educational, like those for the American Revolution ($1.99) and the U.S. Civil War ($1.99). Bonus: You can use the Twitter app of your choice to follow this awesome project: A former Oxford University history student is live-tweeting World War II as if it were happening today, in real time. It should give insight into what life for people on the ground in Europe, and how the people who fought in it experienced the battles. He began on August 31 with the invasion of Poland, and will continue to update consistently in real time, as if it were 72 years ago.